A team of paleontologists, including a University of Pennsylvania doctoral candidate, has described a new species of dinosaur based upon an incomplete skeleton found in western New Mexico. The new species, Jeyawati rugoculus, comes from rocks that preserve a swampy forest ecosystem that thrived near the shore of a vast inland sea 91 million years ago. The dinosaur, whose name translates to mean “grinding-mouth, wrinkle-eye,” was most likely an herbivore that ate the ferns and conifer trees found as fossils in the same rock layer. A basal hadrosauroid, the find included partial skull bones, several vertebrae and fragments of the ribs. Jeyawati is a close relative of the duck-billed hadrosaurs, which were abundant across the Northern Hemisphere for much of the Late Cretaceous Epoch, between 80 and 65 million years ago. 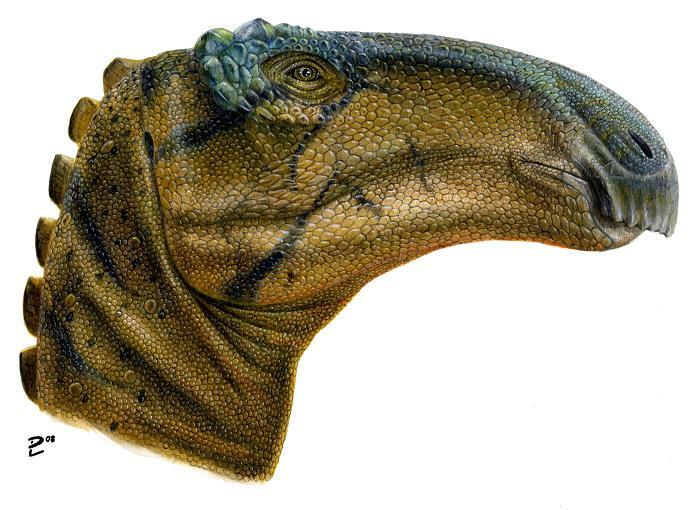 Jeyawati retains some primitive features of the teeth and jaws that preclude it from being a fully-fledged hadrosaur. Jeyawati, pronounced “HEY-a-WHAT-ee,” is derived from two words in the language of the Zuni people, a Native American tribe located around the Zuni River in western New Mexico. The name is a reference to the sophisticated chewing mechanism evolved by the herbivorous lineage to which Jeyawati belongs. The second part of the name, rugoculus, comes from the Latin words ruga and oculus and means “wrinkle eye,” describing a unique feature of the new species. One of the bones that forms the eye socket exhibits a peculiar rough or wrinkly texture on its outer side, suggesting that Jeyawati rugoculus might have sported one or more large scales above and behind its eye. Although the fossil remains were discovered in 1996, it has only now been confirmed that the species is unique. Jeyawati is a member of an assemblage of dinosaurs and other animals unknown as recently as 15 years ago. McDonald began his classification of the find while a student at the University of Nebraska, before completing the work with Peter Dodson, professor of anatomy and paleontontology in the schools of Veterinary Medicine and Arts and Sciences at Penn. The bones now reside at the Arizona Museum of Natural History, where specimens of other dinosaurs uncovered in this region are also located. Dinosaurs that coexisted with Jeyawati include Zuniceratops, the earliest known North American horned dinosaur, and Nothronychus, a strange herbivorous beast belonging to a lineage that, until the discovery of Nothronychus, was known only from Asia. The partial skull and other fragments of Jeyawati were discovered by paleontologist Douglas Wolfe, principal investigator of the Zuni Basin Paleontological Project. Subsequent excavation and collection was carried out for 13 years with the aid of James Kirkland, state paleontologist with the Utah Geological Survey, and volunteers from the Southwest Paleontological Society, among others. In 2006, McDonald, then an undergraduate geology student, began a project to describe the fossil. The analysis revealed that the bones were sufficiently distinct from those of other dinosaurs to warrant the naming of a new species.